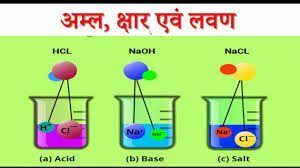 Hello Friends, Agar aap class 10th ke student hai or Science subject ke Acids, Bases and Salts Topic ko padna chahte ho to Is post me hum Acids, Bases and Salts For Class 10th in Hindi ke bare me padne wale hai jisme aap what is acid, base, salt अम्ल, क्षार एवं लवण me Antar, Paribhasha or Prakar ke bare me details se padege. Is post me aapko Acids, Bases and Salts ( Amal, Chhar or Lavan ) ki Hindi PDF bhi provide ki gyi hai Jisme अम्ल, क्षार एवं लवण se related question and answer diye gye hai jise aap is post me diye link se download kar sakte hai is acid base and salt class 10 in hindi pdf me aapko sabhi important question diye gye hai jo exams mai aate rehte hai. अम्लीय लवण (Acidic Salts) वैसे लवण जिसमें एक या एक से अधिक स्थानांतरण योग्य हाइड्रोजन परमाणु बने रहते हैं। जैसेः NaHCo3, NaHSO4. To dosto kesi lagi aapko yeh post Acids, Bases and Salts For Class 10th in Hindi | अम्ल, क्षार एवं लवण hame comments kar ke jaroor bataye or is post ko apne dosto ke sath share karna na bhule. What is the ph value of human blood?? Blood is normally slightly basic, with a normal pH range of 7.35 to 7.45.